Dirt + Water = Mud-luscious! 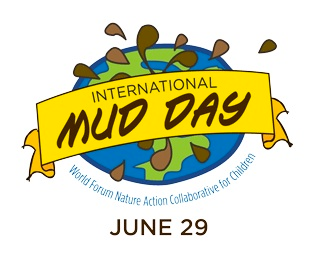 On Sunday, June 29, children all over the world celebrated International Mud Day by getting messy with mud — one of nature’s best play materials! 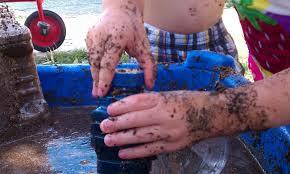 Buy some clean fill, black dirt or potting soil and dump into your sensory/sand and water table. Add child sized gardening tools, an array of containers, flower pots, artificial flowers, rocks, seed pods, sticks, plastic insects or dinosaurs. If you have the room and the resources create a permanent digging patch. You can buy the dirt from a nursery or building supplier. Mix in approximately 1/3 sand to 2/3 soil to provide a more “diggable” mix. • Make mud castles, houses or forts using buckets and assorted containers. Use sticks for supports. Include tunnels, secret rooms, and even a moat. • Make rivers and dams. Dig a river in the dirt and add water. Build a dam to form a small puddle. • Bring in the toy trucks and props to create a construction zone. Create personal mud patches, smooth with hands and watch kids finger paint in the mud, write in the mud with sticks, make mud prints by placing mud-covered hands and feet on a clean sheet of paper, drive a toy car through the mud…the possibilities are endless..
• Set out an easel or find a large cardboard box. Instead of paint, fill your paint cups or sand buckets with mud and let the children explore with brushes or their fingers to make mud paintings. Add items from nature (leaves, petals, pine needles) to mud paintings creating a mud collage. • Make mud balls by shaping mud into balls by rolling the “dough” in your hands. Decorate the balls with flowers, leaves, rocks, or small twigs. Stack the mud balls on top of each other to create a unique sculpture. Similar to your indoor/dramatic play housekeeping area, the kitchen requires a cooking appliance—an old plastic stove or box made into an oven. If you can find an old cabinet or dresser, the children will have a place to work and store materials. Tree stumps or tree cookies can also be used as table surfaces. Old pots and pans, mixing bowls, spoons, utensils, funnels, and other kitchenware give the kitchen an authentic feel and offer lots of different opportunities for play. 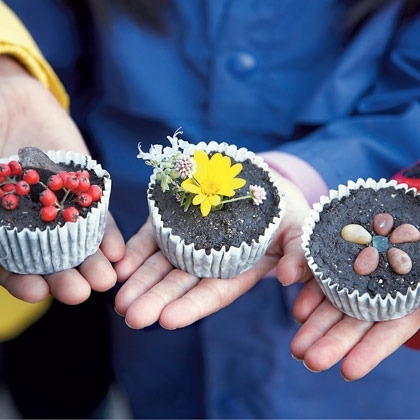 • Make Mud Pies & Cupcakes—use old cake or pie tins, muffin tins, and even shallow plastic containers. Once the pies or cupcakes are “baked,” it’s time decorate them with pebbles, petals, and leaves. Yum! 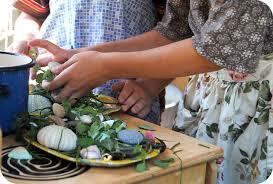 • Make Mud Stew—collect dirt, grass, leaves, twigs, and acorns in a large container. Add some water and Soup’s on! 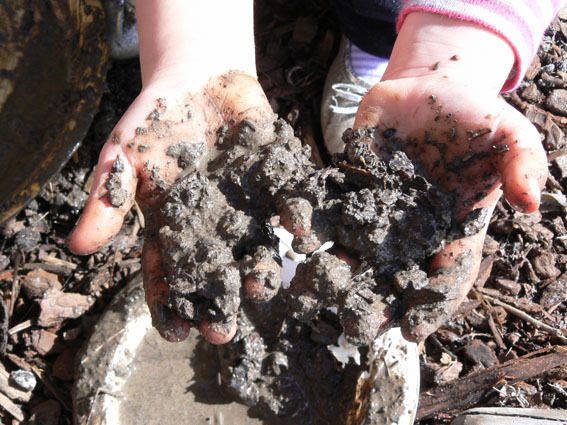 There are so many benefits of mud play besides the tactile, sensory experiences of squelching mud between fingers and toes. Children develop hand-eye coordination, learn about cause and effect, have fun co-operating, communicating, socializing, sharing, problem solving, discovering, laughing, experimenting, building, negotiating, imagining, and yes, getting a little dirty in the process. If you find it hard to allow mud play in your early childhood program, you are depriving the children of a childhood that is well-lived and messy!